It was all the rage in 2017. Not long after contrarians like Jeff Gundlach and Russell Clark said to go long Emerging Markets, suddenly everyone was doing it, either as a standalone trade or as part of a pair trade shorting one or more DMs. Of course, maybe all they were doing was indirectly shorting the USD, which was arguably the biggest driver behind EM outperformance. But, in no small part due to the recent surge in the dollar, after outperforming developed equity markets by 20% in 2016-2017, EM is underperforming by 2.5% so far this year. Of course, it's not just the dollar, but also interest rates, which until the recent Italian fiasco, were at 4 year, or greater, highs. And, as JPM's Michael Cembalest writes in his latest "Eye on the market" note, investor fears are predictably focused on the impact of rising US interest rates and the rising US dollar on EM external debt, and on rising oil prices. And yet, despite the occasional scream of terror from EM longs who refuse to throw in the towel, a closer look shows that the market reaction has been orderly so far, with two exceptions: Argentina and Turkey, which are leading the way down. However, as the JPM Asset Management CIO shows below, the collapse in these two countries has been largely a function of state-specific/idiosyncratic reasons. 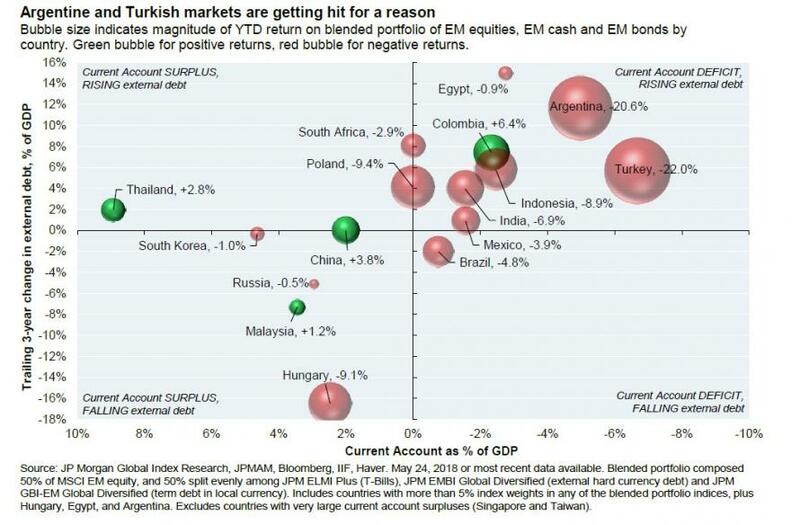 The chart below, courtesy of Cembalest, shows each country’s current account (x-axis), the recent change in its external borrowing (y-axis) and the return on a blended portfolio of its equity and fixed income markets (the larger the red bubble, the worse the returns have been). This outcome looks sensible given weaker Argentine and Turkish fundamentals. And while Cembalest admits that the rising dollar and rising US rates will be a challenge for the broader EM space, most will probably not face balance of payments crises similar to what is taking place in Turkey and Argentina, of which the latter is already getting an IMF bailout and the former, well... it's only a matter of time. On Turkey (0.9% of the MSCI EM Index), President Erdogan lost a battle with markets when he finally agreed to higher interest rates to defend the lira. The big risk, (as we noted earlier in the wee)k, is the inadequacy of Turkish international reserves to cover its short term external debt, particularly since some reserves could evaporate if it looks like capital controls will be imposed. There’s also $80 bn in Spanish bank exposure to Turkish borrowers. Turkey looks like an unstable EM economy of the 1980’s and 1990’s, and is a country whose problems should not be over-generalized. This goes double for Argentina. 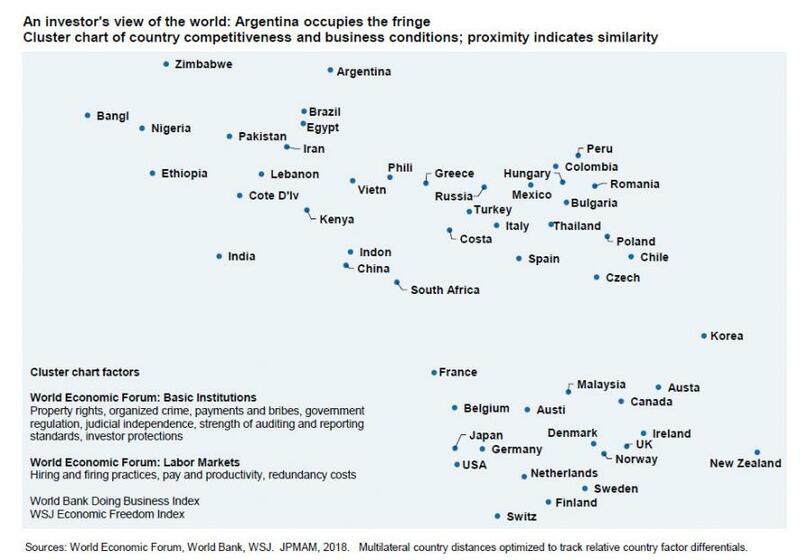 With Argentina dominating EM headlines again, let’s remember what country we are talking about here and not overgeneralize its problems. As shown above, Argentina spent the last 3 years borrowing an enormous amount of money; it has defaulted on its international debt 7 times since its independence in 1816; and spent most of the last decade in investment purgatory (it was jettisoned from the MSCI EM Equity index into the MSCI Frontier Equity Index alongside countries like Lebanon and Kenya). And speaking of Argentina’s ill-fated 100-year bond issued less than a year ago, it is already down 20% from its December peak with what JPM says are "are echoes here from 2001, when Argentina issued new debt just a few months before defaulting on it."